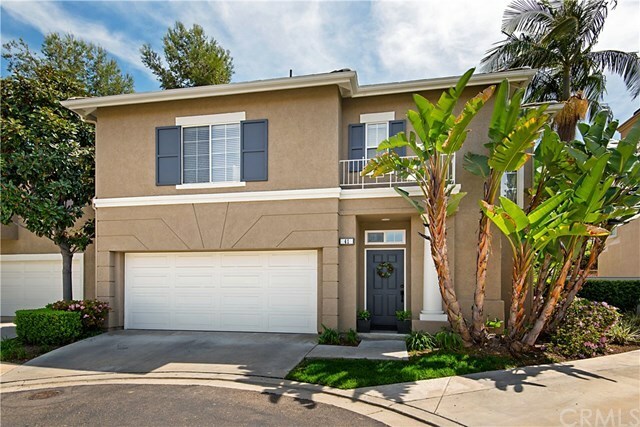 Welcome to this gorgeous model perfect home in the South Mission Viejo Melrose Gated Community. Â Perfectly situated at the end of the cul de sac, this 4 bedroom 2.5 bathroom detached condo features brand new European Oak floors downstairs and luxurious carpet upstairs. Â The kitchen with granite counters opens to the dining area and cozyÂ family room that is light and airy surrounded by large windows and a view to a private back yard patio. Brand new roof, sliding glass door, Smart home with NEST, new HVAC unit with Ecobee thermostat, furnace, and new flooring throughout make this home feel brand new. Designer lighting, hardware and ceiling fans are perfect finishing touches. Two upstairs bedrooms connect with a Jack and Jill bathroom and the larger fourth bedroom can be used as a bonus room. The master bedroom includes a walk in closet and dual bathroom sinks. The gated Melrose Association pool and spa is walking distance from the home and Lake Mission Viejo Amenities include fishing, boating and hiking. Â Low HOA fees and the access to freeways, shopping and entertainment will support your affordable and convenient lifestyle in South Orange County. NO MELLO ROOS, One of the lowest property taxes in South OC!